Happy Friday, everyone!! Here’s a look I wore a couple weeks ago (you might’ve seen it on my Instagram). Every time I wear these shoes I get SO many compliments! I seriously can’t get enough of them (plus they’re only $37!!!!). I hope you all have an amazing weekend, thanks for stopping by! Super lovely and girly combo! Love your dress! That dress is gorgeous and the top underneath it is the perfect detail. OMG girl these shoes are amazing!! Love the look! Thanks so much Tess! They’re different but kinda fun! Love this! So chic, lady! What a pretty dress, I love the embroided detail on it! Loving that dress! Seriously so cute, and I love the blouse underneath it! What a cute spring outfit, Rach! I love how you’ve layered the dress with the pretty blouse and those shoes are too cute; I want a pair myself now! Thanks for sharing and I hope you have a great weekend ahead! Thanks so much!! Happy Weekend! How cute is this dress! I love the embroidery! Beautiful!! Love the dress! I have almost hit purchase like 10 different times on the skirt version. I see why you get so many compliments on these shoes! They are the bomb! Cute outfit girl! Loving the boho vibes of this dress, happy Friday! Love the dress paired with wedge brogues! Adore this look!!! 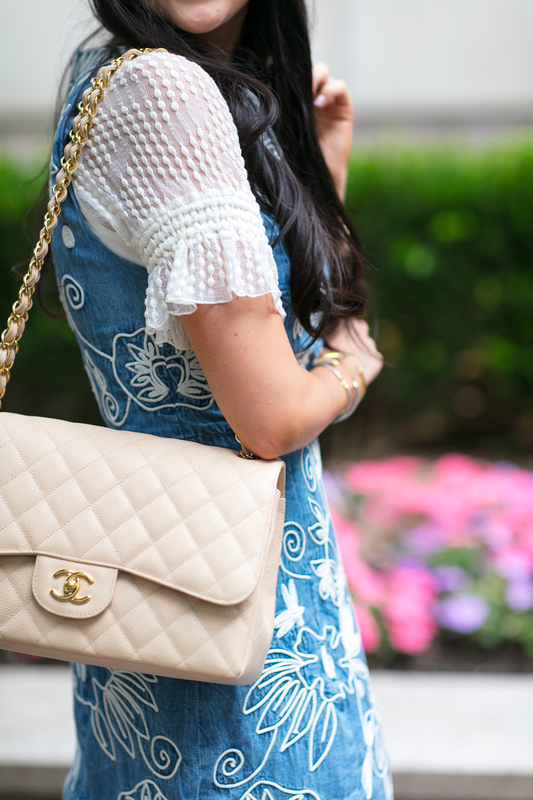 And that Chanel bag is just gorgeous!!! May I ask what color it is? I love this youthful and playful combination. one of your beeeeeest outfits!!!!!!!!! Love the outfit! I recently purchased the Chloe Nile, would love for you to check out my blog post. I’m so pumped you got the $37 ones! I totally expected them to be the Stella McCartney’s. I have them in black! I like that outfit very much, those shoes looks so cute and dress too. That bag though seems like too bulky i know i know it \s designer and so on but idk why it looks weird. I’m completely in love with this dress! I am loving this dress and those aren’t my style at all but surprisingly I actually quite like them here! Ahhh this look is just so effortless and chic, and those shoes are seriously so cool! Loving this dress! It’s so unique and too cute! Amazing outfit, I love it!! When I see your outfit I immediately get in love of your shoes and I went to the webpage to purchase them, they send me a confirmation to the success purchase but now 12 days after just they told me that they don’t have stock and they continue showing the shoes in the web page. It’s un believable that you show us in a great way and promote the brands with successful outfits but when we go to buy receive a poor service from those brands. You styled these wedges so well! I love this look!